Based on Alexandra Bracken’s books, “The Darkest Minds” is about a pandemic, called IAAN, which has wiped out 98% of people under 20-years-old, leaving behind a mutated 2%. This 2% is divided up by a color system, designating their mutated powers, with green being the safest and red being the most dangerous. Green means they’re highly intelligent, blue means they’re telekinetic, yellow means they can control electricity, orange means they can control the minds of those around them and red means they control fire. Someone should really flip orange and red in terms of danger. Red and orange children are immediately murdered by the government once the scientists figure out their color code. Ruby (Stenberg) is an orange, but before they can off her, she uses her powers to convince the lab coat scientists she’s a green. So she’s shuffled in with the rest of what’s left of America’s youth to work camps, while our country figures out the cause and origins of IAAN. I haven’t even touched on Ruby’s parents, the time jumps, or President’s son who is also an orange. By the way, this all is thrown at the audience in the first few minutes so fast that you’d suffer whiplash trying to digest it all. “The Darkest Minds” is a mix of “X-Men” and “Divergent.” I begrudgingly mention “X-Men” and this film in the same sentence. It’s a very by-the-books film that is only mildly amusing because of its main young actor. Stenberg, who’s actually better than her IMDB suggests, provides an emotional weight to Ruby, even when we’re trying to figure out what the hell is going on with the plot. I give points for the movie making Ruby sympathetic, brave and an endearing female lead, but also subtract points for the cliché beats her character goes through. I don’t want to pile on anymore to a movie that has somewhat good intentions and I’m sure is based on a decent book (I say decent because it has warranted five sequels). 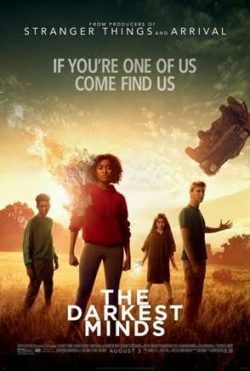 “The Darkest Minds” may have been better with love and care, or maybe if it came out during the “Harry Potter” films. It might please a younger audience that’s new to the genre, but for those of us who’ve seen these films come out every year since “The Hunger Games,” the air around these young adult films continues to stagnate.